COATINGSPRO NOVEMBER 2015 59 dishes were covered and protected during blasting and painting." It took several weeks for Rockledge to complete the intri- cate scafolding project, the centerpiece of which was a sky-high catwalk under the belly of the tank. With all parts of the tank 's exterior now accessible, the A lpine team rigged containment comprising 10-mil (254.0 microns) fame-retardant Eagle Scaf-Lite to meet pertinent emission control requirements. Te crew then reached for their trusty sandblasting gear. "Not so quick!" said Ofsharick. 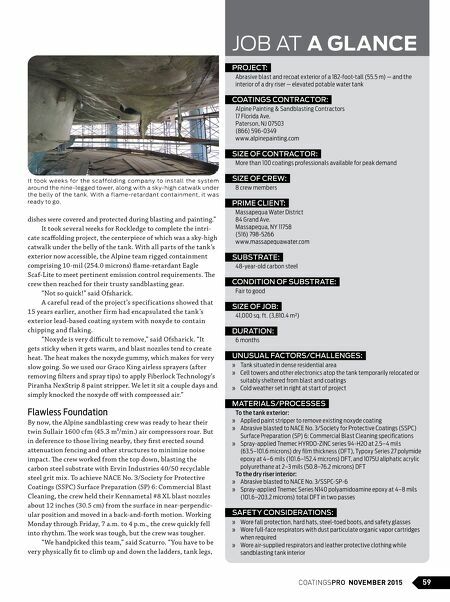 A careful read of the project's specifications showed that 15 years earlier, another firm had encapsulated the tank 's exterior lead-based coating system w ith nox yde to contain chipping and f laking. "Noxyde is very difcult to remove," said Ofsharick. "It gets sticky when it gets warm, and blast nozzles tend to create heat. Te heat makes the noxyde gummy, which makes for very slow going. So we used our Graco King airless sprayers (after removing flters and spray tips) to apply Fiberlock Technology's Piranha NexStrip 8 paint stripper. We let it sit a couple days and simply knocked the noxyde of with compressed air." Flawless Foundation By now, the A lpine sandblasting crew was ready to hear their twin Sullair 1600 cfm (45.3 m³/min.) air compressors roar. But in deference to those living nearby, they frst erected sound attenuation fencing and other structures to minimize noise impact. Te crew worked from the top down, blasting the carbon steel substrate with Ervin Industries 40/ 50 recyclable steel grit mix. To achieve NACE No. 3/Society for Protective Coatings (SSPC) Surface Preparation (SP) 6: Commercial Blast Cleaning, the crew held their Kennametal #8 XL blast nozzles about 12 inches (30.5 cm) from the surface in near-perpendic- ular position and moved in a back-and-forth motion. Working Monday through Friday, 7 a.m. to 4 p.m., the crew quickly fell into rhythm. Te work was tough, but the crew was tougher. "We handpicked this team," said Scaturro. "You have to be very physically ft to climb up and down the ladders, tank legs, JOB AT A GLANCE PROJECT: Abrasive blast and recoat exterior of a 182-foot-tall (55.5 m) — and the interior of a dry riser — elevated potable water tank COATINGS CONTRACTOR: Alpine Painting & Sandblasting Contractors 17 Florida Ave. Paterson, NJ 07503 (866) 596-0349 www.alpinepainting.com SIZE OF CONTRACTOR: More than 100 coatings professionals available for peak demand SIZE OF CREW: 8 crew members PRIME CLIENT: Massapequa Water District 84 Grand Ave. Massapequa, NY 11758 (516) 798-5266 www.massapequawater.com SUBSTRATE: 48-year-old carbon steel CONDITION OF SUBSTRATE: Fair to good SIZE OF JOB: 41,000 sq. ft. (3,810.4 m²) DURATION: 6 months UNUSUAL FACTORS/CHALLENGES: » Tank situated in dense residential area » Cell towers and other electronics atop the tank temporarily relocated or suitably sheltered from blast and coatings » Cold weather set in right at start of project MATERIALS/PROCESSES To the tank exterior: » Applied paint stripper to remove existing noxyde coating » Abrasive blasted to NACE No. 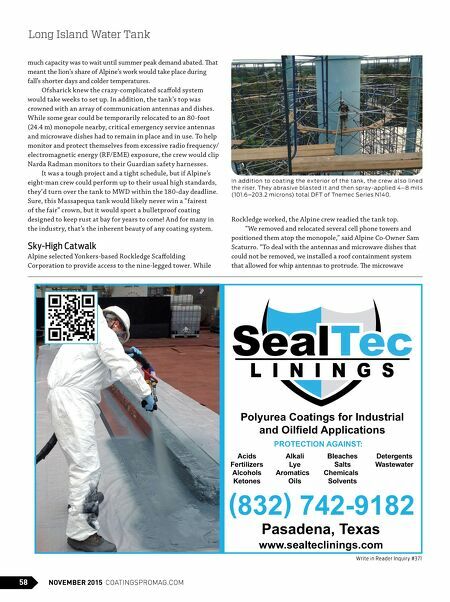 3/Society for Protective Coatings (SSPC) Surface Preparation (SP) 6: Commercial Blast Cleaning specifications » Spray-applied Tnemec HYRDO-ZINC series 94-H2O at 2.5–4 mils (63.5–101.6 microns) dry film thickness (DFT), Typoxy Series 27 polymide epoxy at 4–6 mils (101.6–152.4 microns) DFT, and 1075U aliphatic acrylic polyurethane at 2–3 mils (50.8–76.2 microns) DFT To the dry riser interior: » Abrasive blasted to NACE No. 3/SSPC-SP-6 » Spray-applied Tnemec Series N140 polyamidoamine epoxy at 4–8 mils (101.6–203.2 microns) total DFT in two passes SAFETY CONSIDERATIONS: » Wore fall protection, hard hats, steel-toed boots, and safety glasses » Wore full-face respirators with dust particulate organic vapor cartridges when required » Wore air-supplied respirators and leather protective clothing while sandblasting tank interior It to o k we e k s fo r th e s c af fo ld in g co m p any to in s t all th e s y s te m around the nine-leg ged tower, along with a sk y-high cat walk under the b elly of the tank. With a flame -retardant containment, it wa s ready to go.